Google Play Music allows any users to upload up to 50,000 songs for free. So if you have subscribed Apple Music, you may think that you can upload your favorite Apple Music songs to Google Play Music for online storage or playing music with Google Play's web player. However, Google Play Music only supports a few audio formats. However, downloaded Apple Music songs come with DRM protection and the file extension is M4P which is not supported. To solve the problem, you need to convert Apple Music to MP3 with Apple Music Converter first. The rise of streaming music services like Apple Music and Spotify helps people to enjoy unlimited songs at a relatively lower price like $9.99 per month. It seems that Google's streaming music service, Google Play Music, is not so popular like other streaming music services, but actually it's not a late comer and you can even think Google Play Music is a pioneer. 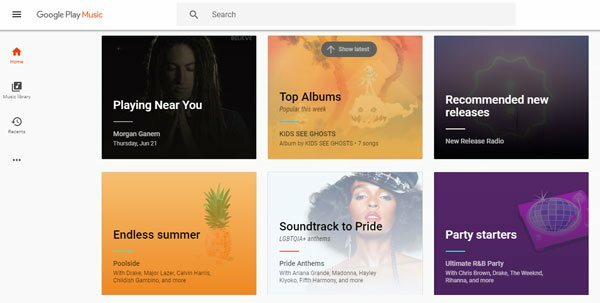 Google Play Music was announced on May 10, 2011 and after an invitation-only beta period of half a year, it was publicly launched on November 16, 2011. With 30-day free trial of an "All Access" subscription and over 40 million songs in catalogue, Google Play Music is a good alternative to Apple Music and Spotify. 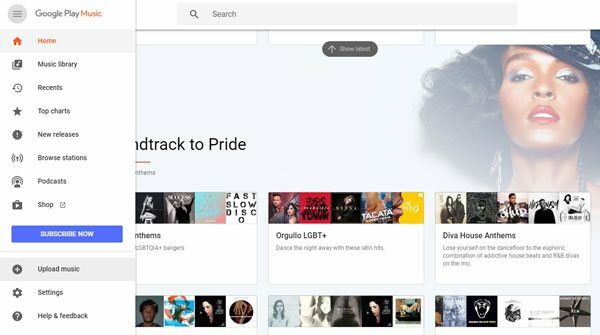 Users can purchase additional tracks for their library through the music store section of Google Play. Of course, Google Play Music also allows you to stream songs directly with internet connection on iOS and Android devices, and download songs for offline listening. One of most noticable feature is that Google Play Music allows any users to upload up to 50,000 songs with free account. Google Play Music natively supports MP3, however, if your songs are in M4A, FLAC, Ogg, ALAC format, files will be converted to the same bitrate (quality) .mp3 files. If you have subscribed Apple Music and want to upload your favorite Apple Music songs to Google Play Music, you will have to convert Apple Music songs to MP3 first. General audio converter can't handle Apple Music songs as they are DRM protected M4P files. But don't worry, it's just as easy as a breeze if you use the professional Apple Music to MP3 Converter called TuneMobie Apple Music Converter. TuneMobie Apple Music Converter is an all-in-one iTunes audio converter as it can remove DRM protection from Apple Music songs and M4B/AA/AAX audiobooks, convert Apple Music songs, audiobooks, purchased M4A songs from iTunes store, other iTunes compatible audio formats to plain audio formats. 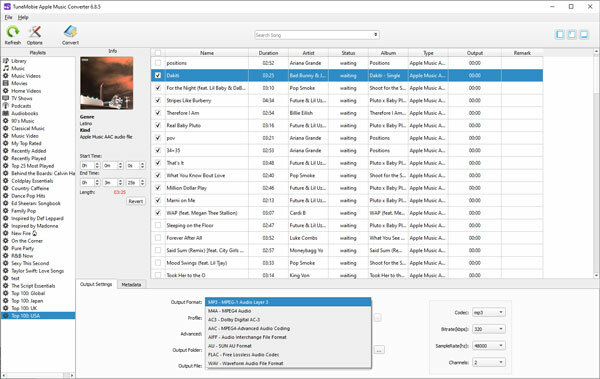 Supported output audio formats include MP3, M4A, FLAC, AIFF, AC3, AU and MKA, and all the ID3 tags like song title, album, artist, genre, track number, artwork, etc. will be 100% preserved in the output files. Besides, Apple Music Converter can also extract audio from home videos and DRM protected M4V videos you purchased from iTunes Store. 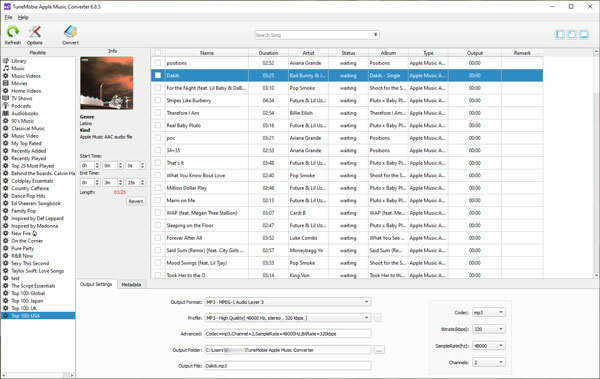 TuneMobie Apple Music Converter helps you easily organize and rename the output files by ID3 tags and characters. Besides, the built-in tag editor allows you to edit metadata before conversion. Batch conversion is perfectly supported. And up to 16X faster conversion can be done on Windows 7/8/8.1/10 and macOS 10.9.5 - 10.12. The Windows version can even convert the Apple Music songs you haven't downloaded to iTunes library but you you have added. Launch Apple Music Converter and iTunes will be also launched automatically. Apple Music songs will be listed in Music playlist or separated Apple Music playlists. Choose Apple Music songs by ticking the checkboxes. Or tick the top checkbox to choose all the songs in the playlist. Besides, a built-in search box can be used to locate songs quickly. 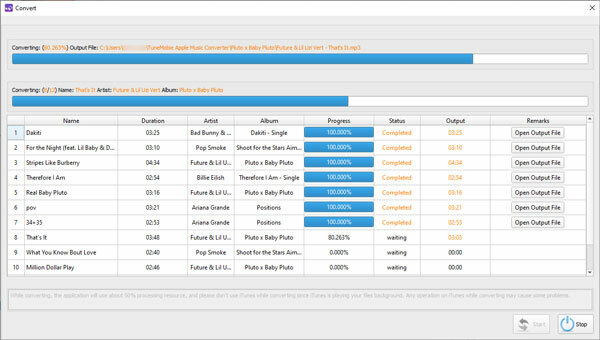 Apple Music Converter supports up to 7 output formats. However, only MP3 can be directly uploaded to Google Play Music. So let's choose MP3 as output format. Now, simply click “Convert” button to start converting Apple Music tracks to MP3. After conversion, you can click “Open output file” to locate converted Apple Music tracks in MP3 format. Now, open Google Play Music page, click three-line ≡ button in the upper left and click "Upload Music" to start uploading converted Apple Music songs. When it's done, you can use "Google Music Player for Chrome" to play the songs. It's also the best way to enjoy Apple Music on PC with a web player now.